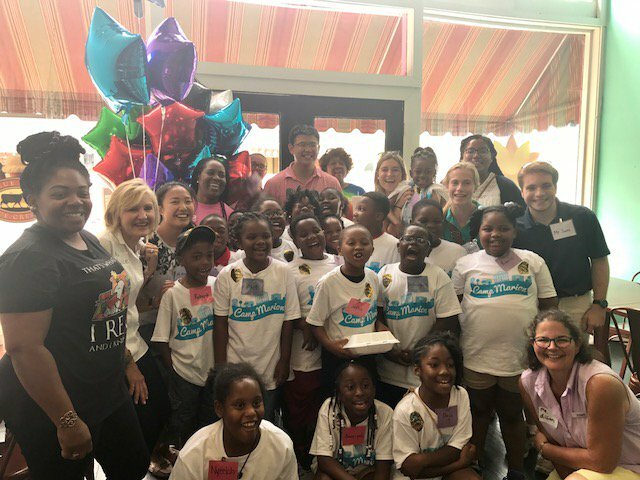 2018 Jean O’Connor-Snyder Intern Samuel Reece reflects on experiences working with local students and volunteers at Camp Marion, a summer literacy program in Marion, Alabama. This article was originally published in The Marion Times Standard. Rising second- and third-grade students enrolled in the 21st Century Summer Enrichment Program at Francis Marion School found fun and more at Camp Marion this summer. Each day from 9 a.m. to noon, students spent their time learning about the community of Marion, practicing writing skills by creating stories about their experiences in Marion, and reading to themselves, each other, and volunteers. Students worked each day to create a poster board detailing one space in their community to display to their parents, guardians, friends and community members. Many of the students attended Camp Marion last year and were excited to return. One student said, “My favorite part is getting to go on a trip because you get something to eat, and you play and see the fire truck. And we get to read our own books.” Camp Marion is part of the 21st Century Program at Francis Marion School, which runs Enrichment Programs for all age groups. “The program is based on a curriculum to help enrich the educational knowledge of our children to better prepare them for their future,” Allison Taylor, the 21st Century site director, said. Camp Marion is coordinated by the University of Alabama’s Honors College and by four UA and Main Street Marion interns who are living and working in Marion. The interns teach and volunteer at the camp each day. In addition, volunteers from Project Horseshoe Farm and the First Presbyterian Church of Tuscaloosa helped the kids with their reading skills. “The volunteers have been a tremendous help,” Hannah Woodard, one of the camp’s teachers, said. She added, “The amount of support we’ve received is phenomenal. The kids have been able to get a lot of one-on-one attention.” On Thursday, June 21, Camp Marion took a field trip to downtown Marion to see what they had been learning about. They wrote about the things they had seen around town and ate lunch at Lottie’s, followed by ice cream at The Social.